On a cool day in May, the VALOR fellows enjoyed lunch, a tour and tasting at Veritas Vineyard and Winery in Afton, VA with two wine industry leaders – Emily Pelton, winemaker for Veritas, and Michael Shaps of Virginia Wineworks. The wine industry in Virginia has exploded over the last decade or so. The number of wineries and vineyards continues to grow, as does the list of accolades earned around the world by Virginia wines. Veritas and Virginia Wineworks represent different approaches to the same goal of offering high-quality wines. Veritas is a family-owned enterprise and grows most of the fruit they use for winemaking. Virginia Wineworks relies on relationships with contract growers to acquire the grapes they’ll ferment and bottle. Both Pelton and Shaps spoke of the need for more large commercial growers in order to meet growing demand. Pelton often emphasizes to customers that she “grew their wine”. 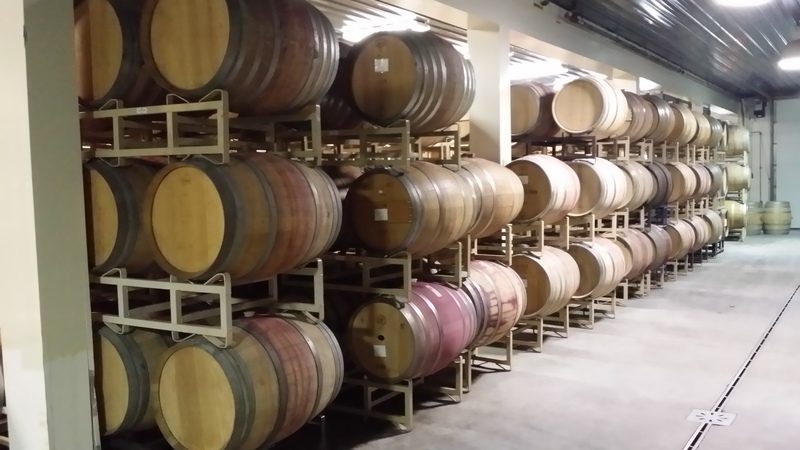 Like many other facets of agriculture, labor, weather, technical expertise, and available acreage for production are all issues faced by the wine industry. Both Pelton and Shaps agree that tourism is critical to growing demand. Customers want to experience the wine, see where it was grown, and enjoy it in a beautiful place. Veritas has capitalized on this desire by creating event venues and hosting wedding, concerts, and other gatherings at the winery. Shaps, on the other hand, advocates simple operations as “good wine is made in the field”. He is testing the market by exploring other ways of packaging and delivering wine – including higher-end boxed wine, and limited barrel runs available in the tasting room only. Veritas and Virginia Wineworks have developed their place in an important wine region. After spending a little time with our hosts, it’s easy to see how professionals like Pelton and Shaps are contributing to the growing prestige of Virginia wine. Our sincere thanks to both for lending their insights to our group and taking time to spend with VALOR.